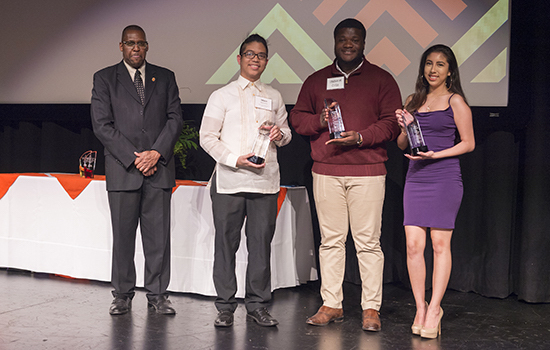 The annual Student Beacon Awards were presented to third-year design and imaging technology student Miko Arayata from the Philippines; Ibrahim Cisse, a third-year Bronx native majoring in environmental science; and Jessica Alvarado, a fourth-year biomedical sciences student from New York City. 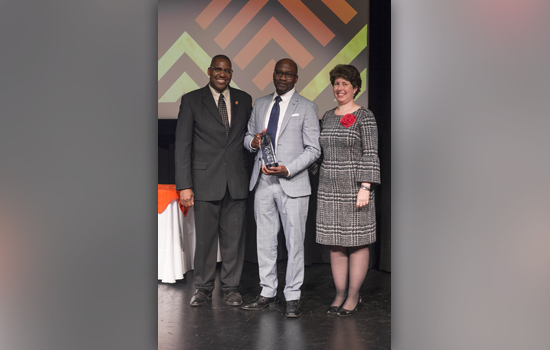 Rochester Institute of Technology’s Division of Diversity and Inclusion (DDI) recognized some of the university’s greatest proponents of diversity and inclusion with annual awards presented at the DDI Celebration of Excellence on April 25. Jeremy Haefner, provost and senior vice president for Academic Affairs. Examples of Haefner’s commitment to diversity and inclusion include establishing the RIT Future Faculty Fellowship Program in collaboration with DDI, funding the Changing Hearts and Minds Award and establishing the AALANA Faculty Advisory Council. Haefner, RIT’s provost since July 2008, will become the provost and executive vice chancellor at University of Denver, effective July 15. James Miller, senior vice president of Enrollment Management and Career Services. Examples of specialized initiatives and activities under Miller’s watch include the Destler/Johnson Rochester City Scholars program, the Native American Future Stewards Program and the Frederick Douglass Scholarship. Miller, effective June 1, 2018, will retire from RIT after 50 years of dedicated service. Jessica Alvarado, a fourth-year biomedical sciences student from New York City. Alvarado was recognized for working to strengthen the community of African American, Asian/Pacific Islander, Latino/Hispanic and Native American (ALANA) students at RIT. This year she helped create the MCAS peer-to-peer mentoring program, chaired the Higher Education Opportunity Program (HEOP) Student Advisory Board, was a peer assistant during the DDI Summer Experience and served as president of the Latin American Student Association and vice-president of the ALANA Collegiate Association. Third-year design and imaging technology student Miko Arayata, from the Philippines. Arayata was commended for being an outstanding student leader at the National Technical Institute for the Deaf (NTID), most recently, as vice president for Asian Deaf Club (ADC). Arayata has served as a student ambassador and been influential in promoting and attaining a working relationship with Discovering Deaf Worlds, a non-profit organization that focuses on enhancing self-determination, empowerment and leadership of deaf individuals from different countries. Ibrahim Cisse, a third-year Bronx native majoring in environmental science. Cisse has contributed to the community extensively by serving as a member or officer with a myriad of organizations on campus including RIT’s Student Environmental Action League, the National Society of Black Engineers, the Organization of African Students and the HEOP Advisory Board. The Alumni Beacon Award is presented annually to a distinguished alumnus or alumna who shines as a model for others to follow and was given to Rick A. Kittles ’89 (biology). Kittles is an international leader on race and genetics, widely known for his research on prostate cancer and complex issues surrounding race, genetic ancestry and health disparities among African Americans and other ethnicities. Since May 2017, Kittles has served as professor and founding director of the Division of Health Equities within the Department of Population Sciences at City of Hope, a leading research and treatment center for cancer, diabetes and other life-threatening diseases based in Duarte, Calif. He is also associate director of heath equities at City of Hope’s Comprehensive Cancer Center. He holds a Ph.D. in biological sciences from George Washington University. Kittles was appointed a member of RIT’s Board of Trustees on April 26. Several student organizations were recognized by The ALANA Collegiate Association (ACA), which is the Representative Student Organization for African, Latin, Asian, Native American students and serves as a liaison between the ALANA student population and RIT administration. The Phoenix Award, which represents an ACA affiliate that has been working hard and shown its true potential, went to WOESS; Women of Excellence Supporting STEM. 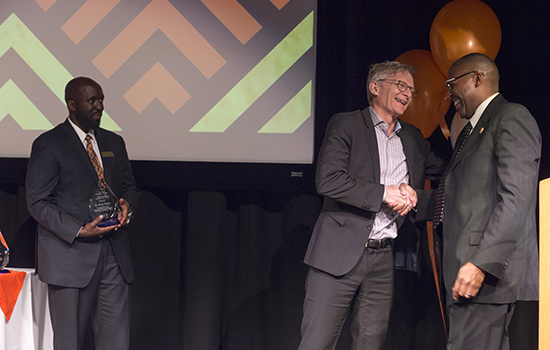 Unity House received the new ALANA Family Award for its work to fostering community at RIT. Velocity Urban Dance Crew received the Affiliate of the Year Award for making an impact on campus through its events and support of others. Two of DDI’s leadership development programs, the Men of Color, Honor and Ambition (MOCHA) and the Women of Color Honor and Ambition (WOCHA) each recognized outstanding members with awards voted on by their peers in their respective cohorts. The WOCHA students voted Brendalis Camacho, a fourth-year biomedical sciences student from Sacramento, Calif. as their Woman of the Year. The MOCHA Man of the Year award went to George Matta, a third-year student from Plainville, Mass. studying mechanical engineering technology. The Alumni Beacon Award is presented annually to a distinguished alum who shines as a model for others to follow and was given to Rick A. Kittles â€™89 (biology). Jeremy Haefner, provost and senior vice president for Academic Affairs, received one of the inaugural DDI Vice-President and Associate Provost Awards. 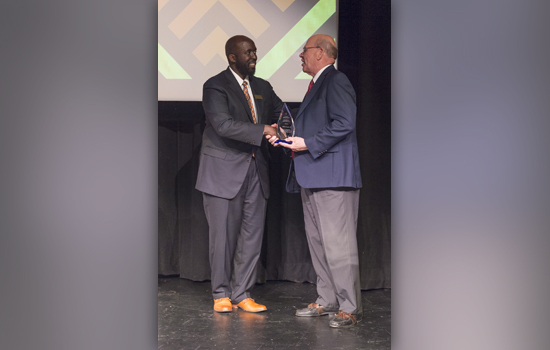 James Miller, senior vice president of Enrollment Management and Career Services, received one of the inaugural DDI Vice-President and Associate Provost Awards.